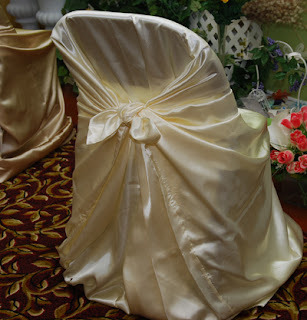 OMG My DIY Wedding: Chair Covers Oh my! Ok, we have established I am a bargain hunter. I have been searching craigslist for wedding things. 2 weeks ago a woman was selling 100 self tie chair covers for $320. You can get 100 self tie chair covers off ebay for $280 with free shipping. I offer her $175 2 weeks ago. She huffed and puffed telling me "No I'm sorry The lowest I will go is $300 I paid $3.32 plus shipping and half of the cover were not used." Last night I saw an ad for 100 self tie chair coves for $280. It was the same woman. I offer her $175. She said "No I'm sorry $280 is what I'm asking you can't even rent 100 of these for that price!" I can't???? I contacted a rental company and asked for a price quote for 100 self tie chair coves. The man told me $450. Oh my! I asked him if that included setup or delivery. He quickly said no. I told him I could purchase new covers for $280. I could tell his jaw dropped. After a few moments he asked me where I could purchase them. I gave him the name of the ebay seller cvlinnens. After a long pause he said "Where can I get china dinnerware?" Hahah! I asked him again how much it was for chair cover rental and did it include set up and removal. He told me $190 and yes set up and removal included. Bingo. I had no intentions of renting. I would have taken the offer if I did not feel like going through the hassle of re-selling them.